Do you guys know that story about Robert Rauschenberg? The one where the interviewer asked him “How do you know when you are finished with a painting?” and he responded “When I sell it.” Meaning, he’s never finished, and as long as the work is in his possession he will keep reworking it forever. This is what came into mind the other night as I stared at the galley of my book, which, in one form or another, has been sitting on my dining room table for the past six months, as I go back and forth from the kitchen tweaking and replacing and reworking and driving my editor and designer crazy. But I had just made this dinner — salmon and brussels sprouts, a combination which I had spied in both Martha Stewart and Real Simple in the same week, then married that with a Momofuku-inspired ginger scallion sauce — and I began to leaf through the pages looking for a place to squeeze it in. It’s so quintessentially DALS — simple, weeknight-friendly, tasty — how could it not be in the book?!! And not that I’m in any way comparing my writing to a Rauschenberg Combine painting, but I do believe it’s just the element that would turn my book from cookbook to masterpiece. It’s so good! It’s so easy! But alas, my deadline was for real this time (I said goodbye to the galley forever — terrifying) so I have no choice but to give you the recipe here and now. Note: This recipe has been updated to address some of the issues raised in the comment field. Thank you for your feedback! Preheat oven to 375°F. Slice a 1 1/4 pound salmon fillet into 4-ounce pieces as shown above. Trim and halve 4 cups of brussels sprouts and in a bowl, toss them with 2 tablespoons of oil (olive or vegetable), salt and pepper. (Do your best to keep all the brussels leaves on the sprout, because those individual leaves burn fast when roasted.) Place sprouts on a foil-lined cookie sheet and roast for 15 minutes, tossing half way through. (And don’t worry, they should look a little charred.) Turn heat to 450°F. 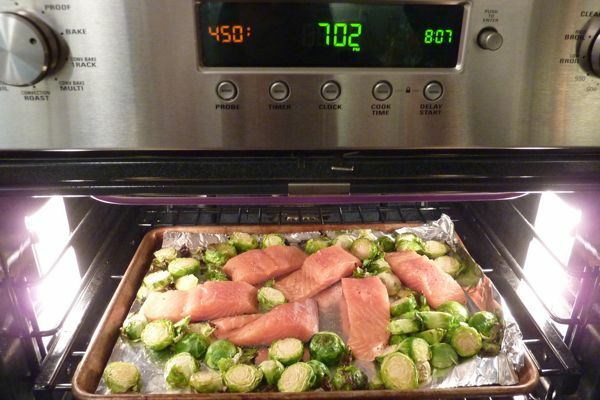 Nestle salmon filets among the sprouts and roast another 10 minutes. Serve with ginger-scallion sauce. Combine the following in a small bowl: 1 large bunch scallions (green and white parts), chopped; 1 tablespoon finely minced peeled fresh ginger; 2 tablespoons neutral oil, such as canola or grapeseed; 1 tablespoon soy sauce; a drop or two of fish sauce (optional) 2 tablespoons sherry or rice wine vinegar; a little chopped mint, a squeeze of Sriracha, salt and pepper to taste. This looks great! It is classic DALS – simple and delicious. We are needing some new ideas at our house. Thanks for the inspiration. the sprouts look so pretty halved! like little green cabbage roses. i bet they hold the sauce so well like that. 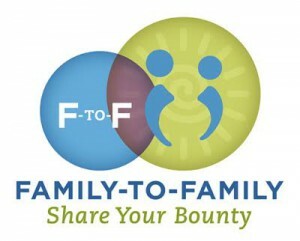 such a great idea and can’t wait for the book. I adore recipes like this, everything in one pan, in the oven. Wow. I have recently discovered that I actually like salmon and sprouts, two foods that I have spent far too many years of my life avoiding. Now I have the perfect dish to celebrate them! This might be a stupid question… but how do you serve the sauce with the veggies and salmon? Was wondering same. Mix them together? Drizzle over? Serve on the side? I am also a salmon and brussels sprouts fan and am excited to try them together. In one pan! Extra-exciting from a dishes point of view. Oh – can’t thank you enough for a new way with brussel sprouts! We were definitely reaching the end of tastebud tolerance for them: this may have bought us a couple more weeks. I haven’t even made this yet and I think it is my new favorite dinner. Thank you!! 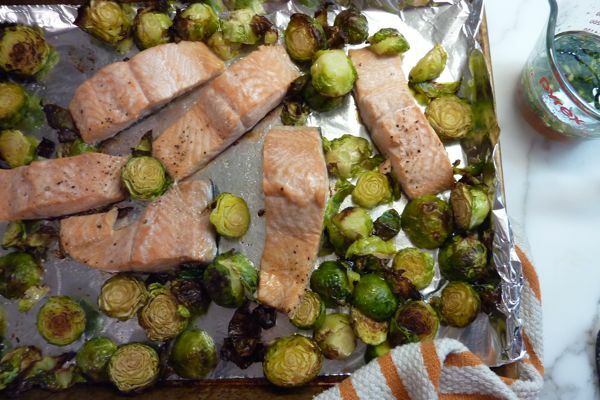 When I think Brussels sprouts I think “hearty,” and when I think salmon I think “light,” so it seems like a very February-appropriate thing to eat, with nods to both winter and the lengthening days that make us long for spring. It was arguably better, which is saying something. Oh goodness. Once I get out of my first trimester funk and am able to consume something that isn’t a baked potato or a crumpet, this is what I am making for dinner. love it! made it tonight and it is PERFECT! thank you! This recipe looks so easy and delicious!!! I will be making it for sure! We made this last night. So good, and surprisingly easy. (Or, as you said, ” simple, weeknight-friendly, tasty.”) Thank you! Delicious .i just made everybody loved it. Do you know where you heard that Rauschenberg story? Do you have a source for it? As someone who works in publishing, I am sure you were driving your editor a bit mad, but with such a tasty subject, it would be hard to stop. As they say “A book is either finished or it is published. Never both.” I am sure the DALS cookbook will be wonderful. Can’t wait to see the finished product. Besides, how can you have a second edition, or another book altogether, if everything was included in the first one? I found your website through Pinterest and I tried this recipe tonight. Thank you so much – it is wonderful! 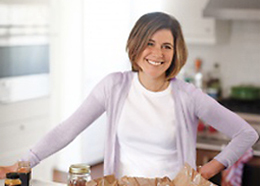 Can’t wait for your cookbook. Did you change the recipe for the dressing? I made this last week, and I don’t recall there being mint…. Did you change the recipe? I made this last week, and I don’t remember there being mint or fish sauce in the dressing. Would you please post the original recipe? Thanks! Damn, you are quick EC! I did add fish sauce and mint (both are optional) but didn’t change anything else. So just omit those if you like it the other way. 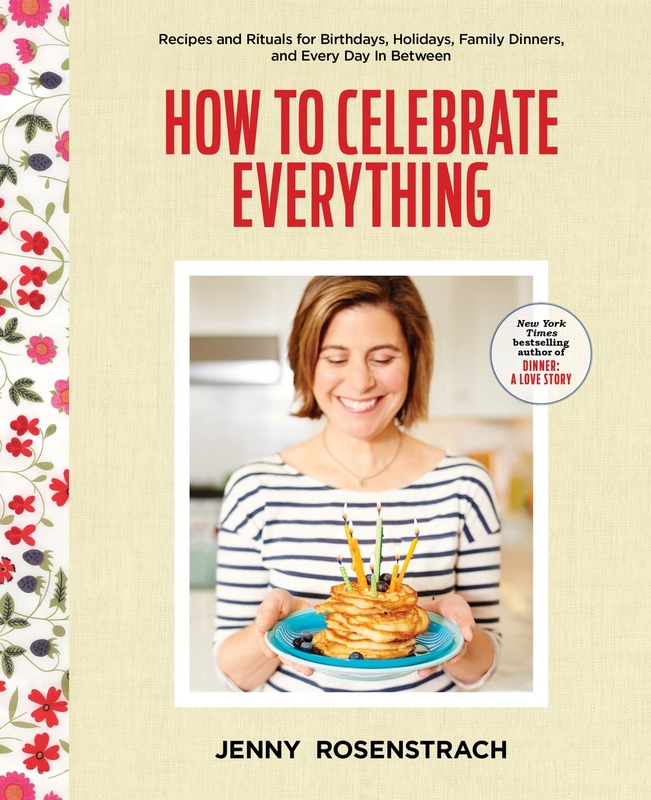 PS: I do this all the time with recipes when I make something over and over and discover new fun ways to make it special. That’s how I know this is a keeper! lol. I did my grocery shopping based on an old print out of the recipe. Then today thought I must be going crazy when I saw the mint and fish sauce! About to go in the oven, can’t wait. I recently came upon your website and have loved everything I tried, including this dish. Tonight I used the ginger-scallion sauce as the sauce on a pizza, topped with shrimp, peppers, and snap peas. It was awesome — thank you! I just tried this with steelhead & sprouts, and it was AMAZING. I brushed the steelhead with some of the sauce before putting it in the oven. It was better than most restaurant fish – moist, shimmering, flavorful. PS – Don’t skip the mint, it was essential!!! Don’t know how I missed this one. Yum. Sure to become a staple in our house. This is my favorite salmon recipe, I’ve made it several times. Wouldn’t change a thing… thank-you so much for the recipe! This is a really amazing way to do salmon. I always make lots of the sauce and then use it on noodles, etc. It’s really, really good. I’ve only done the momofuku version of the sauce, I’ll have to try it with mint and fish sauce, sounds amazing. Help! This looks so delish I thought I’d try making it tonight for dinner. As a newbie in the kitchen though, I’m befuddled by the “sauce” — there is hardly any liquid compared to the amount of scallions and ginger. My sauce is not saucy but more like a wet lump. Where did I go wrong? Thanks and love your site!! I agree, Andrea! My “sauce” was more of a scallion/ginger mixture. No liquid to speak of. Did I misread something??? i really want to make this, but i can’t stop making the Royal salmon with the yogurt, dijon, dill sauce!! we may have hit the wall with brussels sprouts this week anyway…. Made this tonight, but served it with the Yogurt-Mustard Dill Sauce. AMAZING. So easy. My husband and I both said that this should go immediately on “The List” – i.e. the list of food that we make regularly. Thanks again because this is (again) AMAZING. Made this last night and it was amazing and quick and easy! Regarding the ‘sauce’: yes, you will end up with a mixture of scallions and gingers with very little liquid. In my experience that was perfect but if you prefer a saucier sauce simply add some more soy, vinegar and oil. The sauce recipe is flexible that way. Thanks DALS! You could do this with TJs frozen filets and sprouts and add the sauce towards the last 5 to 10 min., right? The fresh looks amazing though. This was DELICIOUS! Perfect with the sauce on the side. I just added ha/f a bunch of scallions. Thanks!